A Building Study on the Canoe Lake Tennis Pavilion is featured in the Architects Journal this month. This was the first commercial project for both the architects, PAD Studio, and Rice Projects. Pad Studio's Lister Tower project completed in 2016 has been featured in this month's Architects Journal. This project marked a departure from the more contemporary construction projects for which Rice Projects is more commonly known. Following it's success, Rice Projects has subsequently worked with PAD Studio on the Southsea tennis pavilion, shortlisted for a 2018 RIBA Award. Garage slab ready for scaffold and timber frame. Work is progressing at the Tennis Pavilion. Both roofs are now watertight, some of the parapet coping stones have been installed and the window are going in. WindowWise installing the ground floor sliders. PAD Studio have entered The Lister Tower into the AJ Small Projects Awards. Fingers crossed! We've just added the Lister Tower project to the website with photographs by Nigel Rigden. This project was something a little different to our usual new build projects - a welcome variation. Woodpeckers continues to gain much attention and is featured in Wallpaper Magazine. See the link below. Rice Projects have been invited to the Wood Awards ceremony next month, with Strom Architects. Woodpeckers is on the shortlist. Since the the foundations were completed work has been progressing well. The structural block work walls and steels are erected. Ready for in situ concrete first floor slab. First job was to set the site up by creating a new access point onto Eastern Parade by installing new site gates and a drop curb. We then erected temporary fencing to secure the site and installed a haul road and crane pad from Eastern Parade up to the existing pavilion. The existing pavilion with haul road under construction. Two storage containers are visible while two accommodation units are yet to arrive. Four all weather courts and the cafe are just behind. The existing pavilion was clad in asbestos which was very carefully removed and disposed of. Following this demolition happened very quickly. 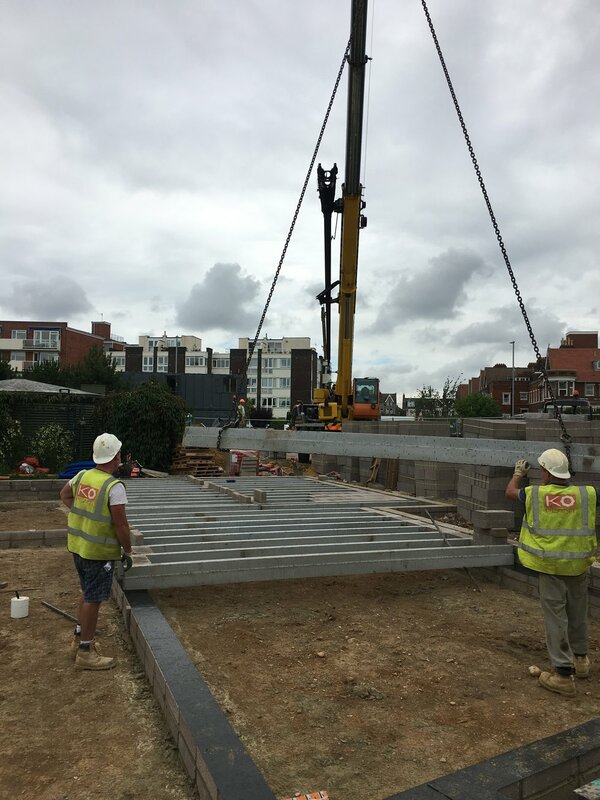 To kick off the blog on our new website, here are a few recent site pics of the careful craning in of the prefabricated steel stair and tin bath. More site photos and news coming soon.